Potholes are a structural failure on the roads surface often caused by high volumes of traffic breaking the asphalt, or water retention in the underlying soil, creating a hole in the road. 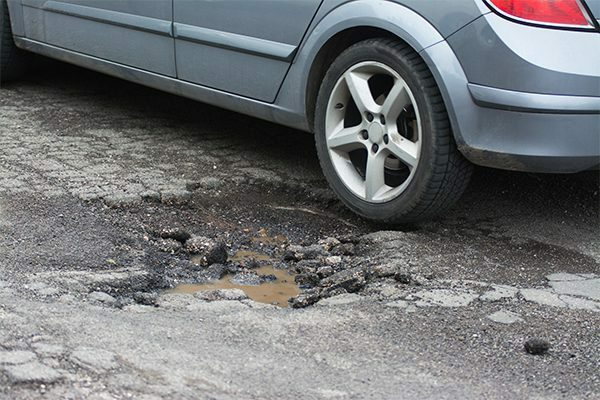 When driving over potholes, minor to severe damage can be caused to your car’s tyres. When you hit a pothole, the tyre is compressed against the wheel. Check for sidewall bulges, sliced rubber or snapped belts on the tyre. If you spot any of these damages, it is best to stop and change the damaged tyre. The course edges of gravel that form the pothole can lead to scratches, chips or cracks on the wheel, causing slow punctures. These cracks and scratches may not be obvious on first close up inspection, so its best to clean the tyre first and then inspect the tyre. The suspension of your vehicle has been designed to absorb impacts but sudden hard knocks from potholes can lead to suspension damage such as misalignment, damaged shocks or broken ball joints. The exhaust pipe is located underneath the car, and can easily get damaged, especially when hitting a deep pothole. Cars with a low profile have a higher chance of experiencing damage to the low-hanging bumpers or side skirts. Ensure your car’s tyres are always inflated according to the car manufacturer’s guidelines. Losing control of your car when you hit a pothole can lead to more damage. Keep your grip firm and do not try to over rectify your vehicle when hitting a pothole. Potholes are often hidden under puddles of water. When possible, avoid driving over puddles. Report potholes to your local municipality, make a note of your exact location, take a photo of the pothole and the damage to your vehicle. Use this as evidence to claim from the Road Accident Fund. Looking for easy vehicle finance? Then contact Earn-a-Car to find out more about rent to own car finance today.